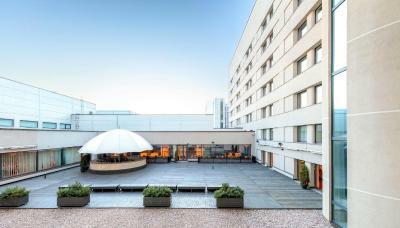 Lock in a great price for Park Inn by Radisson Kaunas – rated 8.6 by recent guests! The hotel is very clean and the staff is very kind. Perfect location! Comfortable and spacious. Parking included and easy to find. Good location. For those traveling with kids the family room is a great choice. In fact it's two joint rooms with two showers/toilets a double bed in one room and a bunk bed in another. There are also some toys there. Good location. Free parkimg and easy to park car. Good WiFi. Location (close to the center), frendly staff, tasty breakfast, three fast elevators, cleanliness room, good price. Simple hotel, but at the same time everything essential was there. Breakfast was really good. Location at the Kaunas is good, perfect that is parking for car. very good breakfast and restaurant. Park Inn by Radisson Kaunas This rating is a reflection of how the property compares to the industry standard when it comes to price, facilities and services available. It's based on a self-evaluation by the property. Use this rating to help choose your stay! One of our top picks in Kaunas.Park Inn by Radisson is located in Kaunas, 600 feet from the Laisvės Alėja, which features numerous cafés and restaurants, and 0.6 mi from the the Akropolis Shopping and Leisure Center. This 4 plus star hotel offers spacious, air-conditioned rooms with cable channels and free high-speed Wi-Fi. 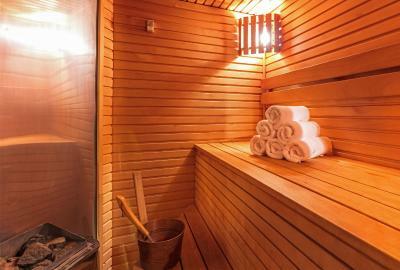 Guests can also work out in the fitness center or visit the sauna, free of charge. The rooms of the Park Inn by Radisson Kaunas feature classic interior design with Scandinavian influences. Standard and Business Friendly rooms include a safe. The private bathrooms have a shower and a hairdryer. 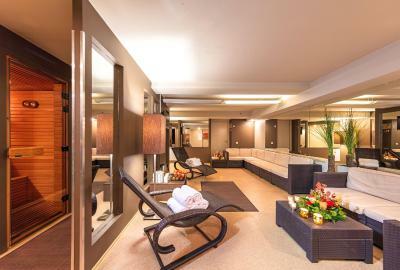 The hotel has a casino onsite as well as a spa and wellness center with a solarium, a massage parlor and a Turkish bath, available for an additional surcharge. Hotel’s Olympic Casino is open all day. There also is a modern conference and events center with eight multi-functional rooms. The Diverso restaurant serves European dishes. In the morning it offers a breakfast buffet. Guests can unwind at the Ginger Bar, which serves light snacks and beverages. Thanks to its central location many of Kaunas’s landmarks are within walking distance. St. Michael the Archangel Church is within 800 feet. The Devil’s Museum is within a 10 minute walk. The Old Town is 0.7 mi away. The hotel is 1 mi from the Zalgiris Arena. The Kaunas International Airport is 9.3 mi away. 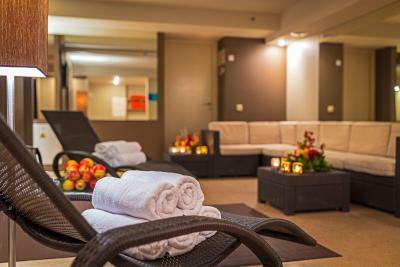 When would you like to stay at Park Inn by Radisson Kaunas? Air-conditioned room with a flat-screen TV with satellite channels. These spacious rooms include a seating area, a safe, a bathrobe, slippers and a bathtub. Air-conditioned room with a flat-screen TV, bathrobe, slippers and additional bathroom amenities. 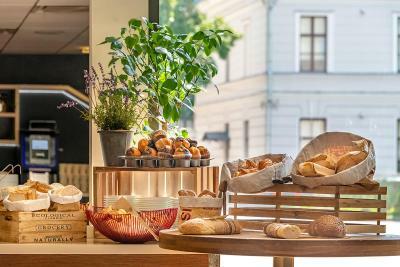 House Rules Park Inn by Radisson Kaunas takes special requests – add in the next step! Park Inn by Radisson Kaunas accepts these cards and reserves the right to temporarily hold an amount prior to arrival. The staff in the restaurant should be more happy. More smiling. Chairs, table, floors looked quite aged and could have renovation/replacement (scratches, paint missing, color worn off, yet not a problem to ignore). Overall room looked bit darker than in the photos. I just kept being distracted by the excessive food/drinks supplies loaded on the cupboard (for extra charge, certainly), it felt a little bit like having mini groceries shop in your room (less is more; guests can get that extra candy in reception or at he bar). And overall impression when you enter the room - I could not stop thinking that we have stayed in 3 stars hotels that gave much stronger impression. Reception and staff was great as they went for an extra mile to solve our issue. Location was just fantastic. Breakfast was really tasty (loved that bacon). It was a really quiet hotel and a place to have some rest. Bed was super comfortable, bath was spacious and had really good quality supplies. The hotel was clean and warm with staff with excellent English. Our room was lovely and comfortable but it was a bit too small. We had previously moved hotel because the rooms had been too small, and discovered that our room at Park Inn wasn't much bigger. On reflection, this may be a cultural thing in Lithuania. I enjoyed the hotel alot. Great staff. Breakfast was very enjoyable. Loved making my own waffles! Very little amenities options there. Overall, the bathroom isn't great, hard to feel comfortable or cozy in there. I got a very small room at first, which wasn't an inconvenience for me because I was going to spend most of the day away working anyway, but can see how could bother some clients staying for a longer time in there. The staff is super nice, all around from reception to the restaurant, they're probably the hotel's best asset. Everybody is diligent and nice, they get out of their way to help you. There was a couple of issues during my stay (change of rooms due to the noise coming from an in-hotel party, and a "failed dinner"), both "their fault" but they were so great trying to fix them and finding solutions, so nice about it, that never really felt like an inconvenience. It is one of the best accommodation options in the city (Kaunas isn't great hotels-wise, though). Good location, short walk distance to the main spots in the city. Also walk-distance to the train station. Some decent restaurants around and the hotel's own restaurant is pretty good. Breakfast is ok, decent quality and fair variety. Rooms are well equipped and fairly clean. I love the Dove products in the bathroom. Bed was quite comfortable. Wifi isn't very fast but worked properly. A TV in my room suddenly turned on it's own about 7AM in the morning . The lighting color temperature in the bathroom is too cold and feels like in laboratory, so not what I actually expected after long working day. The carpet in a room wasn't clean and there were plenty of dust. You have to go to another street around the building to access the parking and the place doesn't look so secure to leave the car for a night. Comfortable hotel mini room with a nice bed and big TV screen. Hotel owns a private parking with a lot of space. Good food selection for the breakfast. Friendly and responsive staff.